SAN DIEGO — One man purchases a trailer and is challenged by a friend to convert said trailer into a functional vessel. The owner of the trailer thinks, “hey, why not?” and accepts the challenge. Three years later, a friendly wager became Y-Knot? 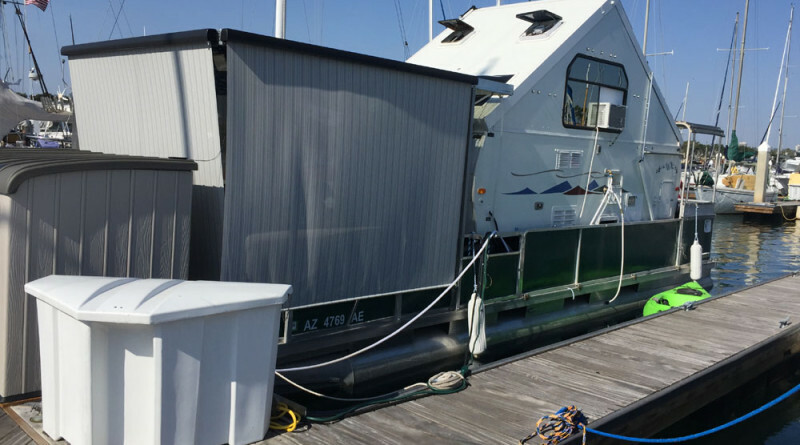 a 16-foot, 2,000-pound trailer attached to a pontoon and docked at Marina Cortez in San Diego. Ron Miller, a semi-retired commercial pilot from Tucson, Arizona, bought a 2007 Chalet XL 1930 a few years ago and instantly fell in love with the trailer. He told his friend, an engineer, life would be perfect if he could somehow enjoy his trailer and be on the water at the same time. His friend responded with a friendly wager: Find a way to get the trailer to functionally operate on water or pay up $100. Miller accepted the bet. What started as a seemingly innocent comment became a three-year project to place a 2,000-pound trailer onto the water. The friend suggested Miller buy a boat. Miller replied he probably would not use the boat often, since he lives in Tucson. A wager was made moments later. Miller started working on the trailer/boat hybrid in 2010 and completed Y-Knot? in 2013. Upon completion he drove Y-Knot? to his friend’s house, surprised him with the finished product and claimed his $100 prize. The trailer-boat hybrid is Coast Guard-approved but designed to navigate flat waters. “The boat is designed for flat water cruising only, even thought it carries a valid and dated Coast Guard Vessel Safety Inspection sticker it is not meant to be taken out to sea,” Miller said. Y-Knot? features three pontoons, a 90-horsepower engine, front-mounted helm and reaches 20 miles per hour at full throttle. Other amenities aboard the trailer/boat hybrid are 100 watts of solar, a permanently mounted queen bed, hot water tank, shower, double basin sink, refrigerator/freezer, toilet, double burner stove, residential style furnace, air conditioning (at a dock) and swamp cooling away from a dock, roof ventilation by powered fan, 17 gallons freshwater capacity and a high definition television with DVD player and stereo. Another trailer-boat hybrid is in the works, according to Miller. “Right now I’ve got plans for a new boat: It will have a brand new 25-foot Airstream trailer mounted on a 45 x 10 tritoon with 350 horsepower. It will be ocean going,” Miller said. In the immediate future Miller plans to stay aboard Y-Knot? in San Diego until Labor Day weekend and then return to his home in Tucson.